We are very selectiv regarding Quality of cats for Show and Breed. P lease fill out the questionnaire and send it back to us therefore we can provide you with professional advise . Thank you. Please contract us as early as possible for adopting a Qo'noS Kitten! 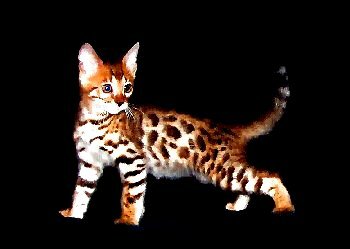 NEW - Woooooow again - Qo'noS' Quantum Leap of Marienda Bengals won Best in Show and Best in Variety on both days at the FIFe show in Banyuls sur mer (France). AND he won Best Kitten Award out of 25 Kitten. Muchas Gracias Carmen you both have done a great job!!!! Woow - Qo'noS' Quantum Leap of Marienda Bengals won Best in Show on both days at the FIFe show in Barcelona September 2007. On Sunday he won Best of Variety!! Muchas Gracias Carmen to show him so professional! Qo'noS Bengals being able to look back to a successful Year 2006. The most important thing was and will be, that all of our kittens found markedly, lovable 'adoptive parents'. 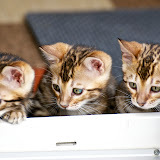 FIf you are interested in a Qo'noS Bengal kitten, please do not hesitate to contact us.